Adjustable Bed Accessories, Bed Rails, Bedroom Furniture. Scroll down to see our selection of Hospital Bed Accessories for sale. Hospital bed accessories are durable medical equipment items used in conjunction with a hospital bed. We carry a large selection of different hospital be accessories. Some hospital be accessories include adjustable bed accessories, over bed tables, bedroom furniture, patient monitoring systems and much more. 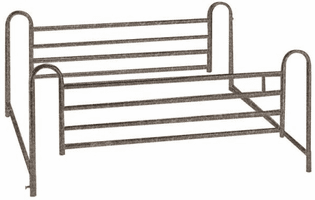 Finding what will help you is easy with our list of hospital bed accessories. Hospital bed accessories are products used on or with a hospital bed to simplify movement and activities in the bedroom. Hospital bed accessories assist care givers, nurses and patients to maintain comfort and safety while transferring or adjusting position. Hospital bed accessories like over bed tables, help people with eating and activities if they are unable to leave the room. Socializing, sleeping and feeling safe can be made easier with the right hospital bed accessories..